How many times have you been in a class and it feels like you just barely make it to one pose (huffing and puffing) before the teacher calls out another? A fast-paced practice absolutely has its time and place, but sometimes it’s nice to slow it down and linger in each pose. Slow Flow yoga unites accessible yoga poses with breathing techniques and fluid movements in a balanced practice. With a slower pace, there’s more time to explore and build confidence in each posture. This thirty-minute practice is excellent for yoga newbies and experienced practitioners alike. Students can revisit the fundamentals of alignment and explore more profound sensations with longer holds. Follow this beautiful flow to unlock your hips, wake up your hamstrings, and open your heart! Find a comfortable seat, using a block or blanket under the sit bones to elevate the hips and lengthen the spine. 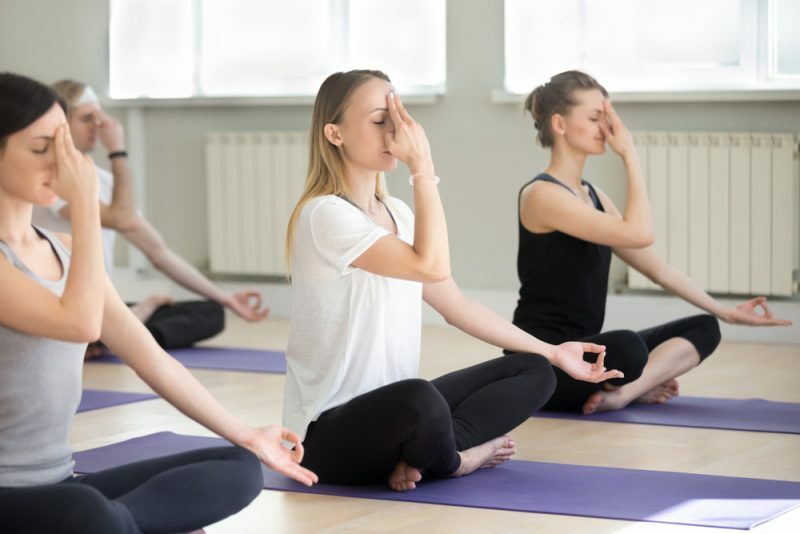 Close your eyes and take a deep breath in through the nose – Notice how the breath feels. Bring the peace fingers on your right hand to your third eye center and use the thumb to block off the right nostril. Take a full breath in through the left nostril, and at the top of the breath, release the thumb and block the left nostril with your ring finger. Exhale through the right nostril and follow with an inhale through the same side. At the top of the breath release the thumb and exhale through the left side. Continue on with this breathing pattern for several minutes. When you’re finished, let both hands rest in your lap and breathe normally. Notice any changes to your natural rhythm. Take a deep breath in through the nose, and as you exhale, drop your chin towards your chest without rounding the spine. Breathe space into the back of the neck. After three to five full breaths, inhale your gaze back up to neutral. Exhale and drop your left ear towards your left shoulder. Avoid letting the shoulder hunch up towards your ear as you extend your right fingertips towards the right. After three to five breaths, switch sides. Inhale both arms overhead, letting the palms touch at the top, and exhale your left fingertips to the floor or a block outside the left hip. Reach the right fingertips towards the left to create space in the right side body. Continue to root down through the right sit bone as you take three to five breaths. Inhale both arms up through the center and repeat on the opposite side. Bring your left arm straight in front of you with a 90-degree bend at the elbow and your palm facing towards the right. Exhale and wrap your right arm under the left, crossing at the elbows. Take a full bind by joining the palms of the hands, or modify with backs of the hands touching. Inhale to lift the elbows up and away from the body while sending your breath to the center of the upper back. Let the shoulders blades soften down. Follow your breath and make three clockwise circles with the elbows. Switch directions for three more breaths and exhale to release the arms down. Repeat on the opposite side. Come to all fours with wrists under shoulders and knees under hips. As you inhale, drop the belly and lift the gaze. As you exhale, round the spine and tuck the chin. Imagine pressing the floor away using the tops of the feet and hands. Flow through this motion five more times. Start standing at the head of your mat with feet at hip-width. Inhale to sweep your arms overhead and exhale to fold forward. Bring a soft bend to the knees and let the arms go heavy towards the floor. Let any tension flow from the base of the spine all the way out through the crown of the head as your upper body grows heavier. Stay here for three to five cycles of breath. Inhale the fingertips to your shin bones and bring your gaze directly forward with a flat back. Draw your shoulders back as you find space in the hamstrings and spine. Hold this position for one full breath. Exhale to step back to a high plank with wrists under shoulders and a level back body. Take a deep breath in and press through the palms to broaden the upper back. Exhale and bend the elbows, lowering halfway down to the floor. 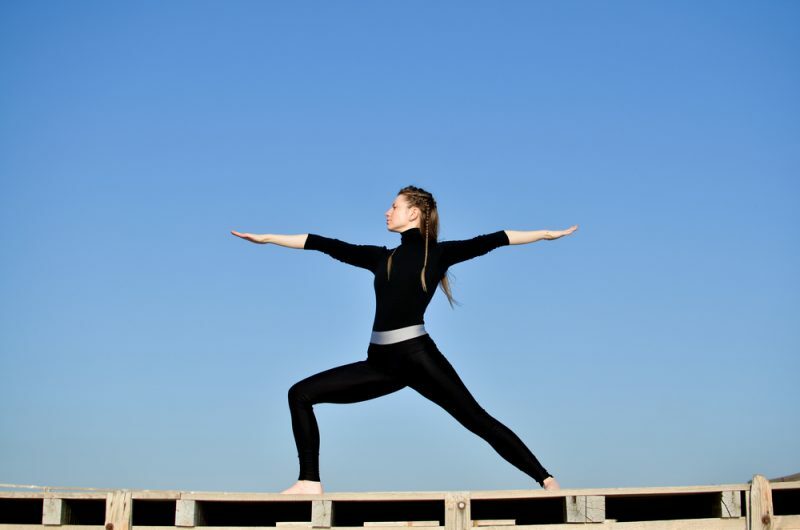 Stay strong and engaged through your entire body as you support this challenging shape. Inhale to come through your backbend of choice. For a more mild backbend take cobra by lowering all the way to the floor and bringing the palms to rest under the shoulders. Press through the tops of the feet and pinch the shoulder blades as you slowly rise up. If you’re feeling ready for a more advanced backbend, take upward facing dog by pressing the arms to be straight and engaging the legs to lift the knee caps off the floor. Release back to the floor on the next breath out. Press into the palms and tuck the toes under as you send the hips up and back for a downward facing dog. Tip your tailbone towards the sky and lengthen the backs of the legs. Release any tension being held in the back of the neck and shoulders by nodding ‘yes’ and ‘no.’ Pedal out the feet by bending one knee and pressing through the opposite heel. Hold this position for five full breaths. From your downward facing dog, step your left foot up between the hands. Turn your right foot flat at a 45-degree angle and inhale upright by squeezing the thighs together and bringing the arm bones up by the ears. Turn the palms inward as the shoulder blades and tailbone descend. Continue to root through the knife edge of your right foot as you bend deeply into the left knee and pull the left hip back. Take five breaths and stay in this position to set up for the next posture. Starting from warrior i, turn the right foot flat, aligning the front heel with the back arch. Bring the arms out wide in a T-shape and the gaze over the front fingertips. Exhale and bend deeply into the front leg, stacking the knee over the ankle and pressing the thigh out. As you breathe in this shape, continue to isometrically pull the inner thighs together while reaching equally with both arms. Stay for five full breaths. In warrior ii, take a deep breath to reach the left arm overhead towards the wall behind you. Drop your right fingertips down the back leg and keep bending through the front knee. Feel the space being cultivated in the left waist as you take five deep breaths between each rib. Inhale back up, bringing the hands to rest on your hips and both legs straight. From this wide-legged stance, inhale your arms out in a T-shape and take your gaze beyond your left fingertips. Exhale to hinge forward at the waist while reaching with the front hand. Once you can’t reach any further, drop the front hand down to either your shin or perhaps a block on the inside of the left foot. Reach your right hand straight up to the sky while pressing down firmly through the back foot to tuck the tail and stack the hips. Continue to breathe into this shape for five full breath cycles. 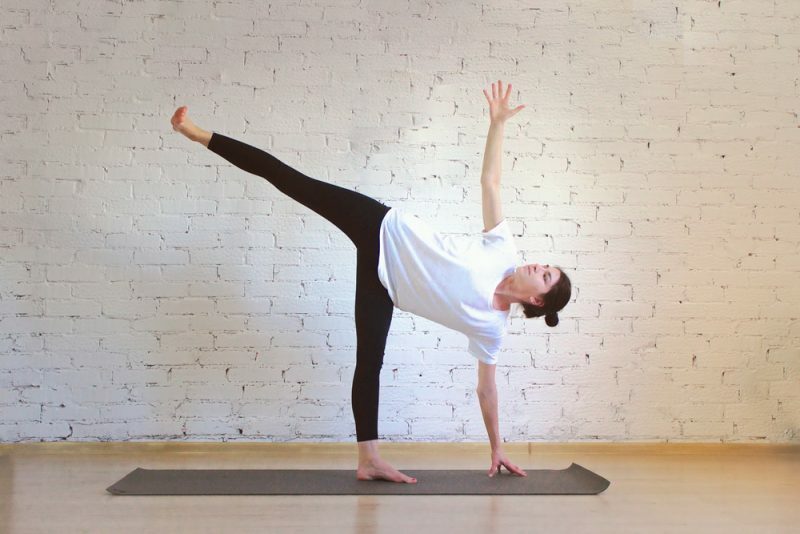 From your triangle pose, bend the left knee and begin to reach the left fingertips roughly a foot ahead of the toes, using a block if necessary. On an exhale, simultaneously straighten the left leg and lift the back foot from the floor. Extend the right leg straight from the hip and reach the right hand towards the ceiling, bringing the gaze up for an extra challenge. Feel the hips stacking and the core pulling in to bring a sense of stability. Hold for five breaths before slowly lowering the right foot back to the floor and finding your upright wide-legged stance once more. Flow through a vinyasa to a downward facing dog and repeat this whole standing sequence on the other side. Once you’ve finished both sides, find your way back to a downward facing dog. Starting in a downward facing dog, bring your left knee behind your left wrist and extend the right leg straight back from the hip point. Bring your left shin as close to parallel with the front of the mat as possible without causing any discomfort. Find a modification that works best for you, taking a bolster or block under the left hip, or finding a seated or reclined variation of the pose. Hold for at least one minute on each side, continuing to breathe through the sensations as they arise. Find a seated position with legs straight in front, and both sit bones grounded. Find a straight spine as you inhale both arms overhead and pull the belly button up and in. As you exhale, draw the kneecaps up the thighs to activate the legs and drape the upper body forward. Continue to breathe here for at least one minute, finding more length on each inhalation and softening down on each exhalation. Slowly roll down to your back with feet planted at hip-width and arms by your sides. Move the shoulders slightly under the back to raise the heart center up. Press through the hands and feet as you lift the pelvis on an inhale. 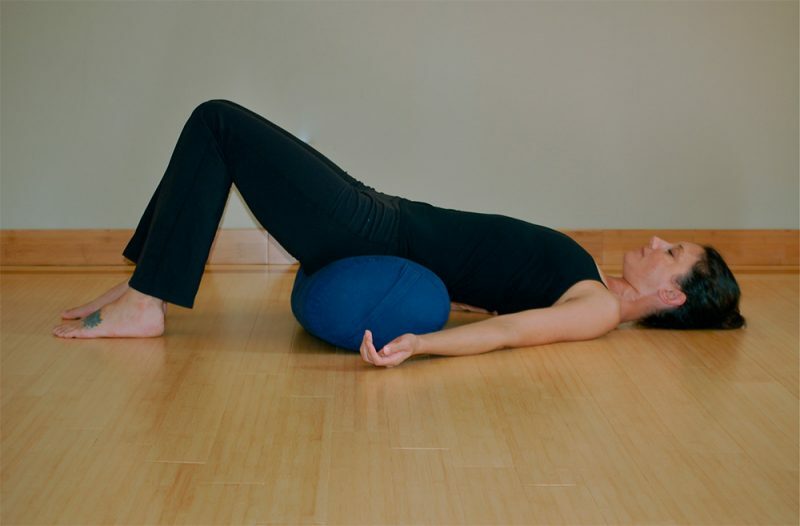 Place a block or bolster under your sacrum and let your full weight melt down. Stay here for one to three minutes, taking any leg variation that feels beneficial. Staying on your back, bring the soles of the feet together and let the knees go wide to the sides. Bring pillows or blankets under the thighs and head for extra comfort and support as needed. Observe the movement of breath in and out by placing one hand on the belly and one on the heart. Let the eyes sink back into the head, and the muscles of the face, neck, and jaw unwind. Stay here for one to three minutes, using the stillness to check in and promote an inner dialogue. Lay all the way down and let your entire body surrender into the mat, employing props to deepen the experience as necessary. Instead of fixating on clearing the mind of thoughts, simply notice where it goes without getting attached. Stay here as long as you’d like to soak in the benefits of your practice.